Hidden cameras can be placed just about anywhere, but some spots are much better than others. You can find some pretty good secret cameras hidden inside of USB charging fixtures or wall sockets. But those can be tough to position properly. After all, you may not necessarily have a wall socket in a location where you want to record. But a picture frame? 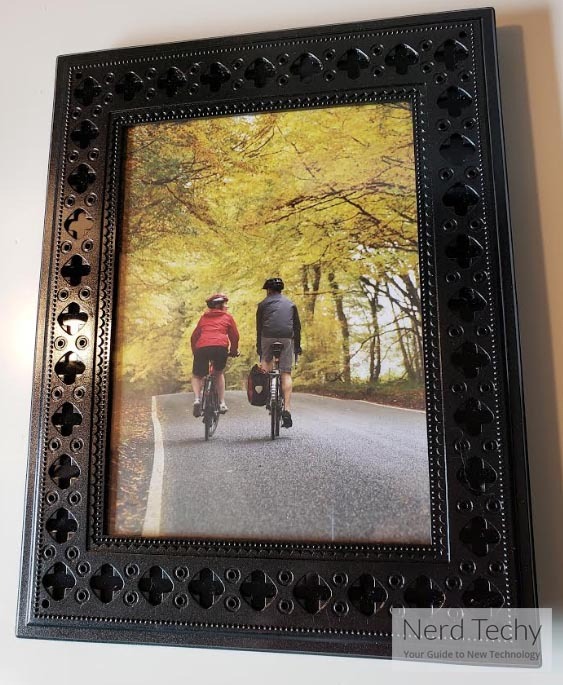 People don’t expect a camera inside of a picture frame, especially a picture frame that isn’t digital! And since you can hang a picture just about anywhere, that makes photo frames an excellent place to hide away a variety of spy cameras. 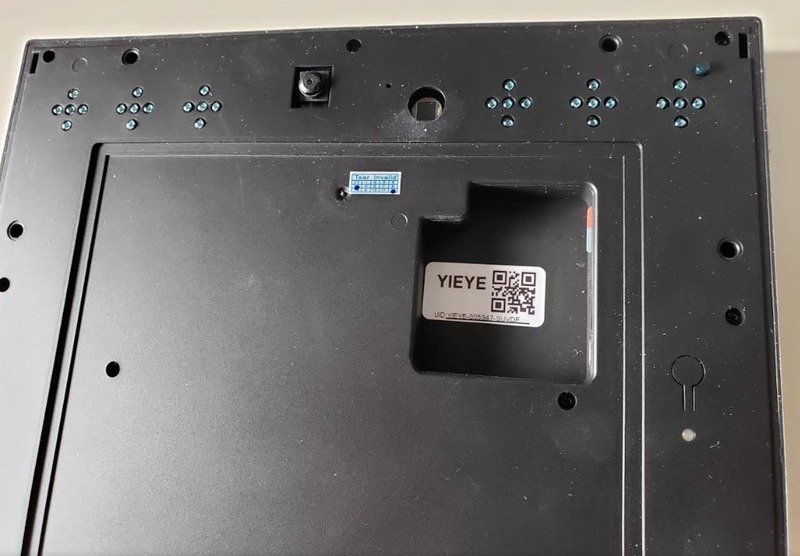 Which brings us to the NuCam Yieye Photo Frame Hidden Spy Camera. Sometimes these types of spy cameras really fail when it comes to one particular aspect of their performance. It might be that the lens isn’t positioned just right, or that the device is just not subtle enough. Maybe it’s as simple as you don’t want to micromanage an SD card, and the device forces you to do it anyway. Whatever it ends up being, some type of problem ends cropping up. But the Yieye Photo Frame was clearly made with a lot of thought put into it. From the angle of the lens to the storage capacity of the device, everything about it seems to have been reflected on carefully. There are only a few places where you might have serious complaints about its design, and after you look a little closer, it’s easy to end up forgiving those complaints. For instance, some reviews state that you can’t actually change the image inside of the frame. This is simply not true. It’s easy to swap out any photo for the stock one that it comes included with. Perfect for a hidden camera. 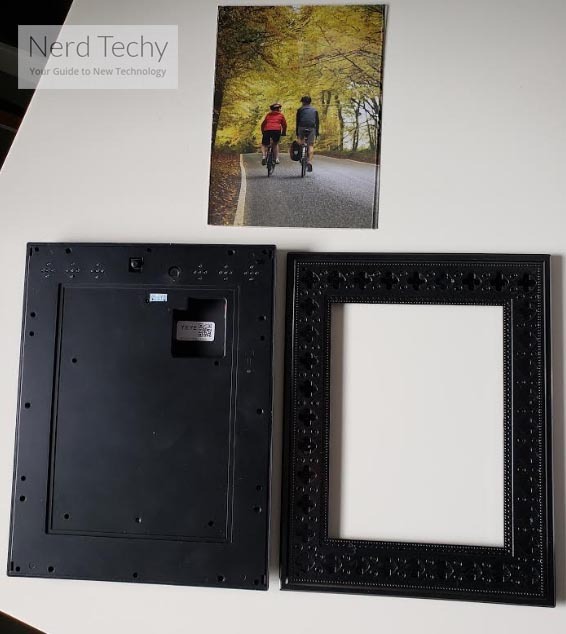 The NuCam Photo Frame Hidden Spy Camera measures 7.8 x 9.8 inches, making it a fairly average sized photo frame. The sort you might see positioned on walls or desks in homes all across the country. Even with all the extra electronic stuff packed inside, this frame still only weighs about a pound and a half. So it’s not tough to hang by any stretch of the imagination. In fact, the backside has a built-in space to hang against a screw. In terms of its subtly, the frame has some ornate latticing patterns along the edge. In addition to being pretty stylish, they’re excellent at helping to disguise the lens. Even if you look closely at the frame and start examining the photo, the lens doesn’t leap out at you. It’s only when you turn to its backside that you can start to identify this is more than a simple frame. The backside has a power on/off button, a small LED indicator to let you know the camera is operational, a light dependent resistor, microphone, and an infrared LED array. In other words, it’s clear this frame is a camera from the backside, or at least a digital device of some kind. 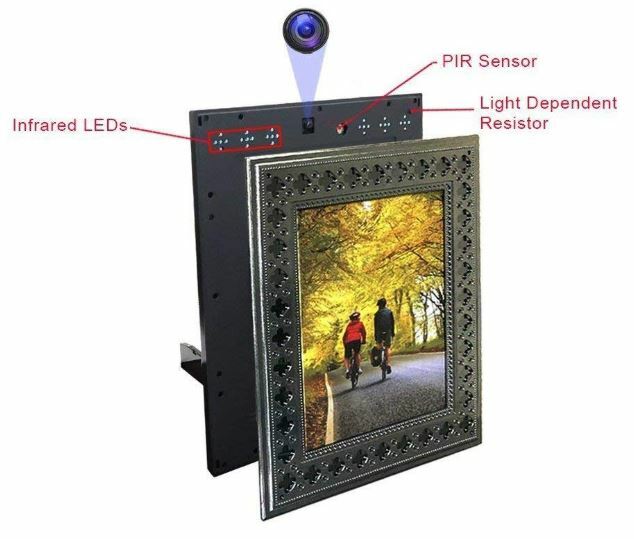 The Yieye WiFi Photo Frame was constructed with Wi-Fi capabilities. That means you don’t need to micromanage a storage card to get your data, adding or removing the photo frame from your wall. Which is great, especially for people who plan on hanging the frame up somewhere high. With the support of Wi-Fi, it’s possible to control everything from your smartphone or tablet, and not have to pull the frame down to do it. In order to make that happen, the PIR motion detector serves to send an alert and start recording the moment it detects motion. From there, NuCam’s app sends an alert to your phone and then records a clip. And the Wi-Fi connectivity is essential to ensuring you can get notifications as needed. Though you need to do some configuration to ensure your phone doesn’t end up getting spammed with messages, once you’ve taken care of it, you generally don’t have to check-up on this camera without having a good reason. 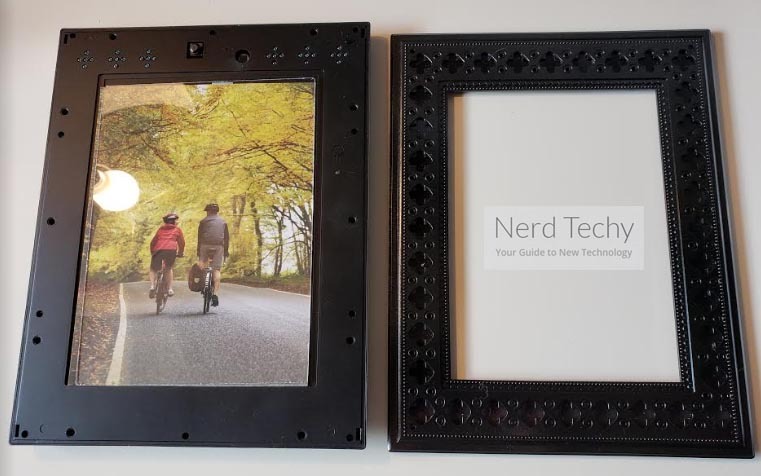 The Yieye Photo Frame captures your content in 720p. High enough of a resolution that you can see things in detail, but low enough that you can still place a lot of video onto a single drive. It would’ve been nice to have 1080p support, but it’s honestly not necessary for this particular type of capture. What’s more important is that the lens was constructed with reasonably good night vision. It’s intended to provide about 20 feet of visibility into the darkness, and it does pretty well for that distance. Anything beyond that and you really lose sight of everything. But for indoor installations, that should provide much of a practical barrier. Unfortunately, the video recording can’t be run continuously, or otherwise triggered wirelessly. 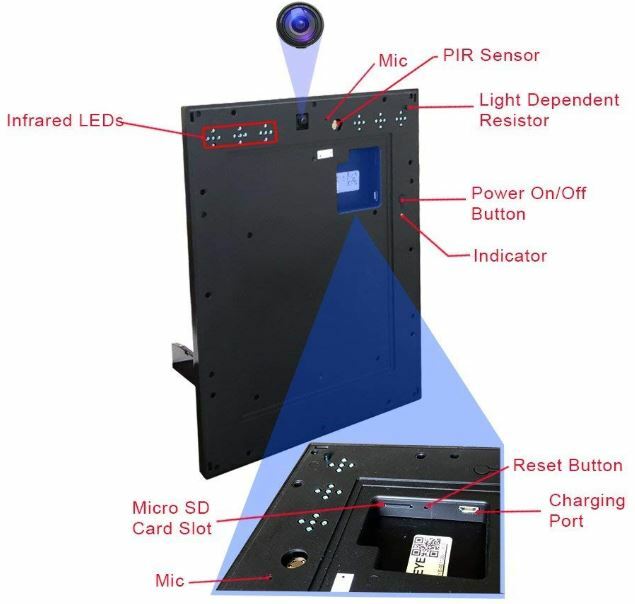 Everything has to be done through the use of the PIR motion sensor. Once motion is detected, clips run between 10-60 seconds, depending on how long the motion lasts. When there’s been no more motion for about 10 seconds, the camera will go back to sleep until motion occurs again. If motion continues for 61 seconds, you’ll end up with two separate files. But they’re named sequentially, so it’s easy to navigate them. Additionally, content is recorded alongside a date/time watermark. The placement of the lens makes your shots angled downward slightly, about 15 degrees. The downward angle of the lens means it anticipates the frame being hung up on a wall. Roughly around eye level, or just above eye level, not necessarily sitting on someone’s nightstand. An ideal angle for most circumstances, but if you plan on placing this frame on a desk instead of a shelf, you could encounter issues. It’s also worth noting the viewing angle of the lens is set to 65 degrees. That’s intended not to capture a panoramic view of an entire room, but instead of capture a narrow focus of what’s directly in front of it. Oddly enough that would be fantastic for placement on a desk. But a more practical place to position this camera would probably be a hallway. Often times, one of the most troublesome aspects of a hidden spy camera like the NuCam Yieye is having to micromanage the battery. Because even when you’re getting a reasonably good spy camera, it’s not uncommon for its battery lifespan to cap out around three or four weeks. Especially if you’re actually making use of the camera on a somewhat frequent basis. The NuCam Yieye WiFi frame was made with a surprisingly large 10000mAh rechargeable battery. That’s actually comparable to the kind of battery you’d find inside of a tablet or laptop. Pretty bulky, which contributes quite a bit to the total weight of this frame. Fortunately, they’ve placed that weight evenly inside of the device, so it doesn’t cause the frame to tilt when hung. Even though these are small details, small details are what counts for a stealthy device like this. How long can you get out of a 10000mAh rechargeable battery? A single charge is supposed to last about a year. But getting to a year really depends on how often the camera ends up getting triggered, how often you engage the Wi-Fi connection, and so forth. With frantic use, you could easily see the battery last closer to 3-months. One more thing to notice is that these length battery times aren’t only because of the large battery. It’s because the device itself has been made to be enormously battery efficient. It doesn’t stay online for a second more than it needs to be. Though for someone who’s recording a lengthy 10-minute video, having that video chopped up into these 2-minute files can be a little annoying. That’s the price you pay for power efficiency. Content is saved to a MicroSD card, which can be accessed and downloaded through any device you connect alongside their app. Since the NuCam Yieye records content in 720p, you don’t tear through storage space. This kit includes a 16GB micro SD card, which ought to be able to provide several days’ worth of continuous storage. So you basically don’t need to micromanage the storage card any more than you need to spend time thinking about the battery. NuCam has two setup videos you can watch if you need a little extra help managing the Wi-Fi setup process. But it’s a pretty straightforward process for people who are used to connecting devices to a Wi-Fi network. Keep in mind, the Wi-Fi connection needs to take place over the 2.4G band. 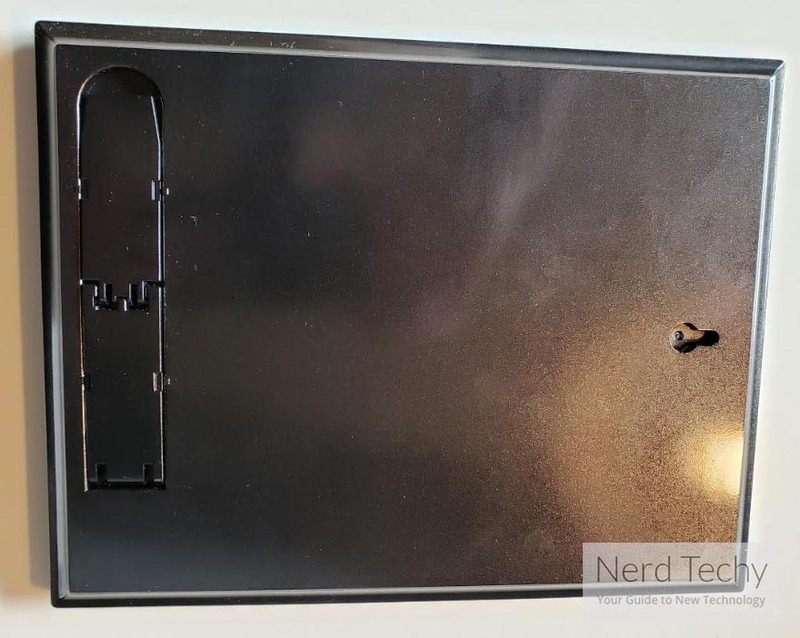 This frame does not support a connection to 5G wireless. The NuCam app supports both Android and iOS devices, so you generally won’t have to worry about compatibility issues. Though if you plan on using an obscure OS, you could encounter a few problems. 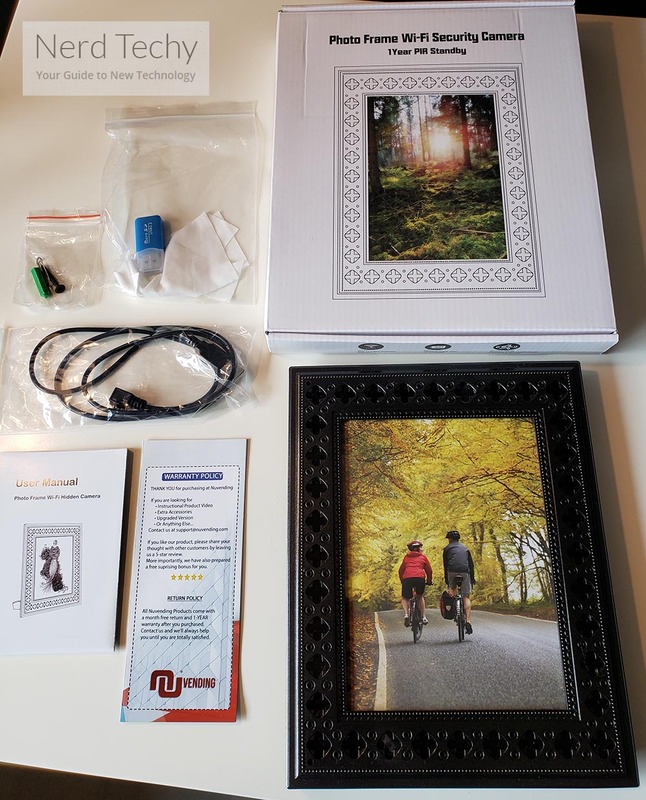 This kit includes a USB card reader, user manual, USB cable, and a photo frame camera with microSD card. It also includes a single screw you can use to help mount the frame. Additionally, NuCam includes a one-year warranty. Who Should Choose the NuCam Yieye WiFi Photo Frame Hidden Spy Camera? The NuCam Yieye is wonderfully stealthy. The lens is essentially totally invisible. The backside of the frame should probably be a little more discreet, making it less suitable for desktop placement in some situations. But ignoring that, it wouldn’t be hard to successfully hide away a camera like this. This hidden spy camera is probably a good choice for someone who knows a good place where they could hang the camera. It wouldn’t be the right choice for all circumstances, clearly. But when you can hang a frame, and you want to have wireless connectivity options, it’s pretty easy to see why you might want to use this camera.